This video discusses and demonstrates a variety of ways to develop experience in the standing position without the need to support the full weight of the body. Practical ways to grade the weight bearing experience, taking weight on the feet, utilizing different supports, and facilitating a readiness to stand are all incorporated into this developmental preparation for standing. 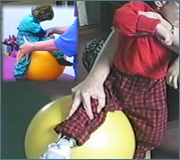 Activities are demonstrated on a doll for clarity.Clinical application examples are demonstrated with children with various levels of disabilities.